Muffin the Cat is made from a fuzzy white material with large pink and black button eyes and a pink nose. Her left ear is made from black material and her right ear is made from pink material which forms a patch on her head. She has a black patch on her back and on the tip of her tail. Muffin was released on 1st January 2013. Her birthday is on 7th January. This is the small 6″ version of Muffin. 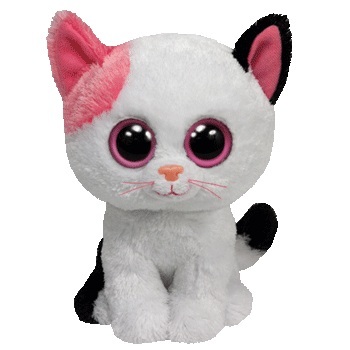 She was also released as a medium 9″ Beanie Boo Buddy and as a key clip. She retired on 6th July 2017.